Pure Kapow Commercial uses a specialized polarized blend of natural lemongrass and other safe botanical insecticides to suffocate mites and other pests on contact. Unlike other products on the market, insects will never develop a tolerance to this formula. Kapow also kills through ingestion, so it is effective on bugs that escape contact during application. In addition, it is a natural anti-fungal that helps kill and prevent mold and mildew from infecting plants. 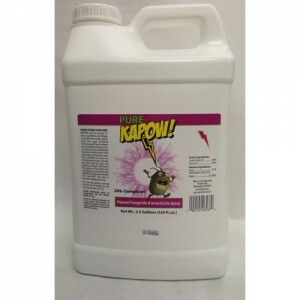 Pure Kapow Commercial is a 25 B exempt pesticide and fungicide, meaning all ingredients have been deemed safe for the environment and planet by the EPA. Pure Kapow Commercial is 9 to 18 times concentrated.